Recommended to: Readers who enjoy contemporary stories with realistic situations and characters. 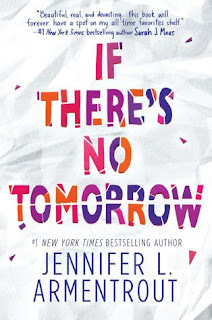 My review for If There's No Tomorrow is later than it should be, both because I had a horrible month of reading last month and because this book took me longer to get through than I anticipated. After reading Arementrout's Covenant series, and falling head over heels for it, I knew I wanted to get my feet wet in other things that she'd written. What I didn't know, was that this book and I were going to go on a roller coaster ride. One filled with too many emotions to count, and not all of them good. Starting out, I should say that Lena is actually a really great main character. She's a teenage girl that I can actually believe in, because she hasn't gotten her life together yet and is still growing. Lena is kind, hardworking, and even though I grew a little tired of her endless self-shaming and guilt, I was able to see where it stemmed from and let it go. I tried to harken back to my own teenage self, and realize that I would have probably been the same way. Lena reads too, which is a plus! I could have done without all the little promo spots for other books and authors in that respect but hey, at least Lena's a reader. Also a plus is the fact that, true to what I remembered, Armentrout's writing is solid and addictive. Despite figuring out what the story thread would be early on, the realistic nature of Lena's character and her situation kept me reading on. I found myself rooting for her a bit, and I always love when that happens. The downside came in the form of those darn predictable YA scenes, filled with the type of cheesiness that makes me want to sigh aloud. I'm all for growing up, and making mistakes, but I wish YA books could do it without all the cliches. That being said, this is a contemporary book and so I was content to let go and let it sweep me on through. It was a slower journey than I expected it to be, but the ending wrapped things up things surprisingly well. It was nice to have a bit of closure after all the emotional growth I'd gone through with Lena. I do wish, however, that this book had been a little more original overall. It was relatable for sure, which is fantastic. There just wasn't anything new, or interesting, wrapped up in these pages. So while it was a solid read, it definitely wasn't one that was overly memorable. I'll happily give If There's No Tomorrow a solid three-star rating, for giving me a relatable story line and a realistic main character. I'll just be looking for more from Arementrout the next time around.